Powers: Glow Worm could generate and release spheres of destructive energy, which he could hurl in a form similar to a "Molotov Cocktail." Bulk had superhuman strength and durability, the extent of which is undefined. In addition, both gave off radiation in dosages sufficient to be toxic to those around him in a short time period. 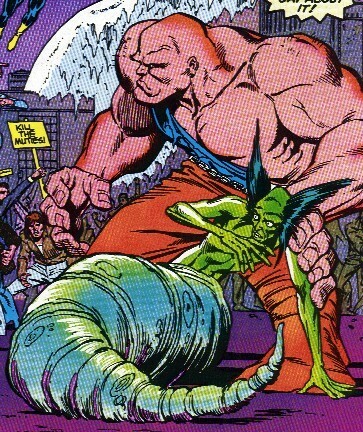 (X-Factor I#7 (fb)) - Bulk and Glow Worm may or may not have once been members of the Morlocks. They were either exiled from them or refused entrance to the Alley in the first place due to his excessively grotesque appearance. It is also not clear if they initially released toxic levels of radiation. Either in the Alley or elsewhere, they met and became close friends with each other as fellow outcasts. Unable to find peace anywhere near the public, the two came to live in a toxic waste dump in New Jersey, just across the Hudson River. Radiation levels in the dump were toxic to both of them, and they knew that they would eventually die from radiation sickness. Even in this dump, they were periodically attacked by either malicious or fearful humans. (X-Factor I#7) - Bulk and Glow Worm decided that they wanted their lives to have meant something, and wished to do something to stop human persecution of mutants. Discovering an advertisement for the alleged mutant-hunters of X-Factor I, they decided to travel to their headquarters and put a stop to their activities or die trying. When they attacked, several members of X-Factor posed as the group, the X-Terminators I, pretending to aid Bulk and Glow Worm, while actually containing their attacks. A few other members of X-Factor, as well as their young trainee, and a few civilian allies, posed as the mutant hunters. X-Factor pretended that their mutant abilities were mutant control equipment and got Bulk and Glow Worm to safety in the sewers below the city, where they explained their true nature. X-Factor wished to help them, but feared that their radiation levels could kill everyone around them, so they sent them back to New Jersey with only a wish for good luck. ((New Mutants Annual#4) - A short time later, during the Evolutionary War, the High Evolutionary sent his Gatherers to collect Bulk and Glow Worm. Terminally ill at this point, the New Mutant Mirage's temporary valkyrie power manifested death images over both of them. Sunspot freed the two of them, but Mirage was captured and attached to a power draining device. Bulk and Glow Worm sacrificed the last of the energy reversing the drain on Mirage, which resulted in a power amplification, enabling her to physically manifest the forms of fears and desires. The New Mutants escaped the High Evolutionary's ship, leaving Bulk and Glow Worm for dead. Comments: Created by Louise Jones and Jackson Guise. Too bad it didn't occur to X-Factor to ask Tony Stark, Reed Richards, or even their own member Hank McCoy to design some sort of radiation containment suits to allow the Bulk and Glow Worm to be treated, rather than send them back to the dump to die. Did the High Evolutionary save their lives and cure them? You never know...but probably not. Toxic Waste? In New Jersey? That's beyond the limits of credibility. Darc_Light adds: I seem to remember seeing Glow Worm on the "Have yourself a Morlock little Christmas" episode of the original X-Men cartoon series, he was in the background in one of the scenes in the Morlock Alley. Glowworm, William Blake, @ Power Man and Iron Fist#123.